In addition to the carbohydrates, fats and proteins are the other two macronutrients required by the human body (see our Carbohydrates module). Fats are a subgroup of compounds known as lipids that are found in the body and have the general property of being hydrophobic (meaning they are insoluble in water). Fats are also known as triglycerides, molecules made from the combination of one molecule of glycerol with three fatty acids (Figure 1). 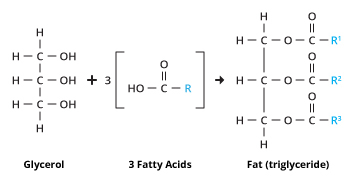 Figure 1: A fat molecule. The R in the three fatty acids represents a long C-C-C chain. In the triglyceride, the Rs may or may not be the same. The main purpose of fats in the body is to serve as a storage system and reserve supply of energy. During periods of low food consumption, fat reserves in the body can be mobilized and broken down to release energy. Fats serve as an insulation material to allow body heat to be conserved and fats line and protect delicate internal organs from physical damage. Fats in the diet can be converted to other lipids that serve as the main structural material in the membranes surrounding our cells. Fats are also used in the manufacture of some steroids and hormones that help regulate proper growth and maintenance of tissue in the body. 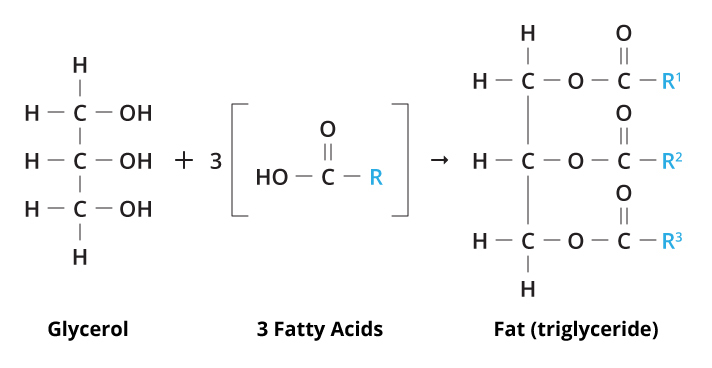 Fats can be classified as either saturated or unsaturated depending on the structure of the long carbon-carbon chains in the fatty acids (the R's in Figure 1). Saturated Fats: Fats that contain no double bonds in their fatty acid chains are referred to as saturated fats. These fats tend to be solid at room temperature, such as butter or animal fat. The consumption of saturated fats carries some health risks in that they have been linked to arteriosclerosis (hardening of the arteries) and heart disease. Unsaturated Fats: Unsaturated fats contain some number of double bonds in their structure. These fats are generally liquid at room temperature (fats that are liquid at room temperature are referred to as oils). Unsaturated fats can be either polyunsaturated (many double bonds) or monounsaturated fats (one or few double bonds). Recent research suggests that the healthiest of the fats in the human diet are the monounsaturated fats, such as olive oil and canola oil, because they appear to be beneficial in the fight against heart disease. 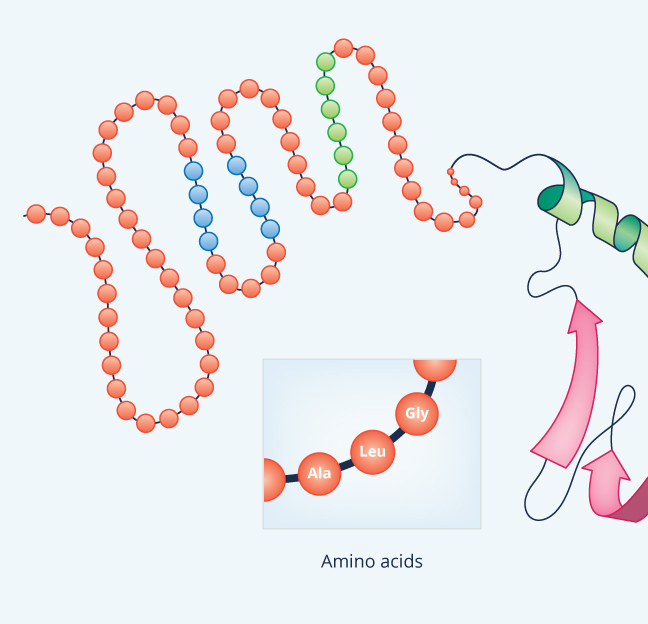 Proteins are polymers of amino acids. 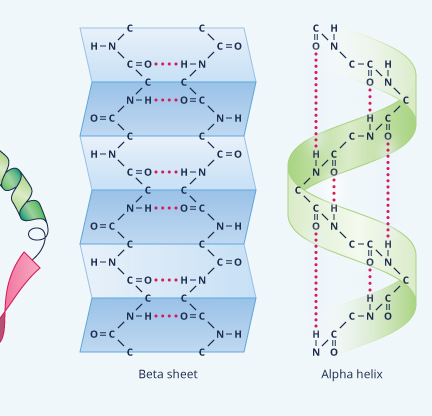 Though there are hundreds of thousands of different proteins that exist in nature, they are all made up of different combinations of amino acids. Proteins are large molecules that may consist of hundreds, or even thousands, of amino acids. Amino acids all have the general structure (see Figure 2). Figure 2: General structure of an amino acid. 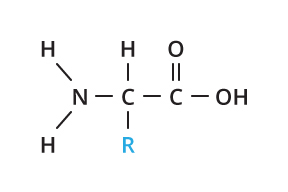 The R in the diagram represents a functional group that varies depending on the specific amino acid in question. For example, R can be simply an H atom, as in the amino acid glycine, or a more complex organic group. When two amino acids bond together, the two ends of nearby amino acids (shown in red) are released and the carbon (called a carboxyl) end of one amino acid bonds to the nitrogen end of the adjacent one forming a peptide bond, as illustrated in Figure 3. 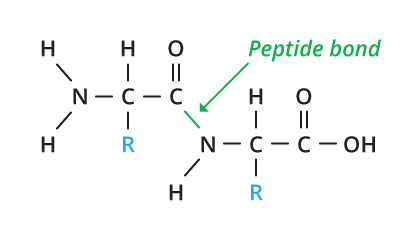 Figure 3: A peptide bond. Structural proteins form most of the solid material in the human body. For example, the structural proteins keratin and collagen are the main component of your hair, muscles, tendons and skin. Functional proteins help carry out activities and functions in the human body. For example, hemoglobin is a functional protein that occurs in the red blood cells and helps to transport oxygen in the body. Myosin is a protein that occurs in muscle tissue and is responsible for the ability of muscles to contract. Insulin is a functional protein that helps regulate the storage of the sugar glucose in the human body. A subclass of the functional proteins is the group of polypeptides referred to as enzymes. Enzymes help to carry out specific chemical reactions in the body. For example, amylase is an enzyme that occurs both in human saliva and in the intestines that helps to break apart the glucose-glucose bonds in the carbohydrate starch, thus allowing your body to absorb the glucose and use it for energy. There are an estimated 100,000 different proteins in the human body alone, and each of them is made up of a combination of different combinations of only 20 amino acids. Each protein has a different structure and performs a different function in the body. When we eat protein-containing foods (such as meat, fish, beans, eggs, cheese, etc.) the polypeptide chains are generally broken down in the digestive tract and the individual amino acids are absorbed into our bodies. These amino acids are then recombined into proteins specific to each individual person in a process called protein synthesis. In order to carry out these very precise jobs in the body, each individual protein has to be unique and specific to the job in question. 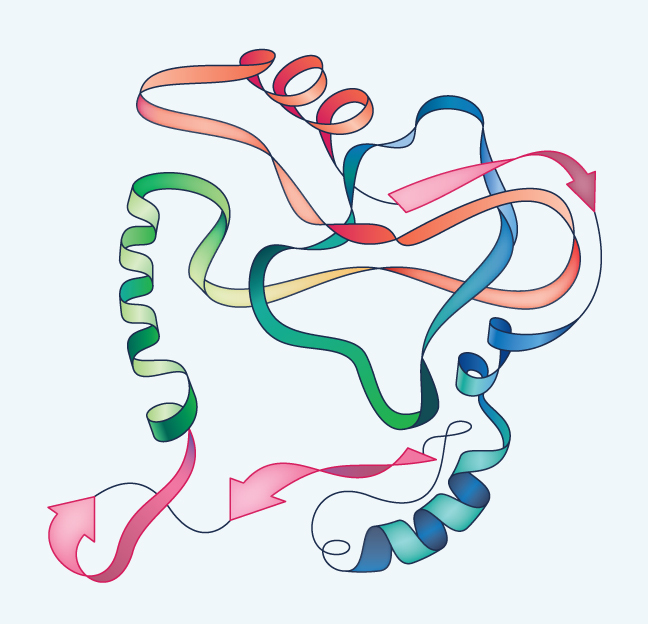 Four aspects of a protein's structure are specific to the job the protein does in the body. Primary Structure (1°): The first aspect of a protein's structure is called the primary structure (1°). 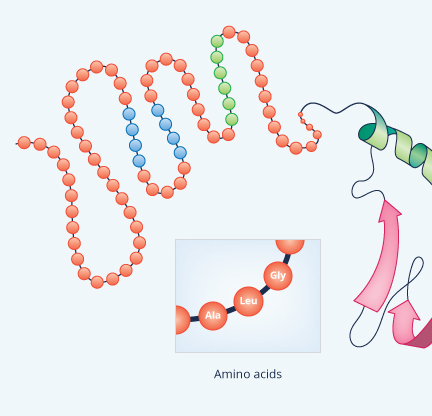 The primary structure of a protein is the sequence of amino acids in the protein. The number of amino acids in a protein can vary from the hundreds to the thousands, and the sequence in which those 20 different amino acids just mentioned occur (obviously one amino acid can occur in a protein many times) is specific to the individual protein, just as the sequence of numbers in your phone number is specific to your phone. Secondary Structure (2°): The secondary structure (2°) of a protein is defined by the way the long strands of amino acids coil about themselves. 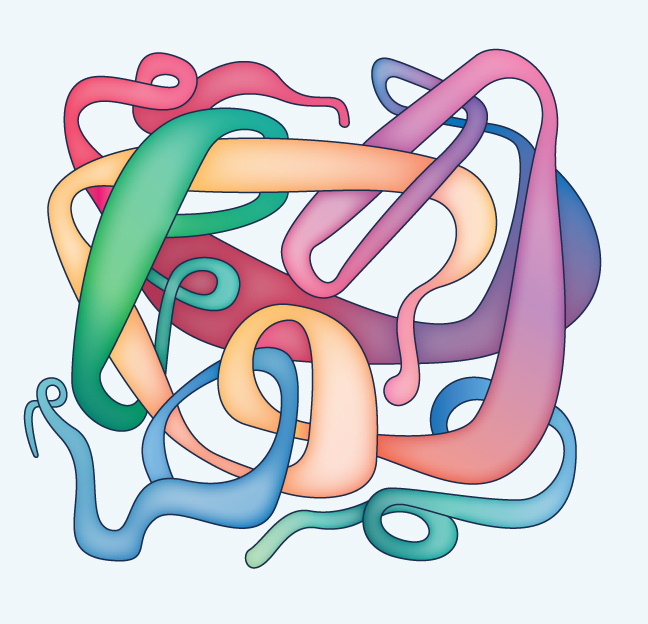 Just as a phone cord wraps around itself to form a coil, a protein will also wrap around itself, and the degree and tightness of the coil is specific to the protein in question. Tertiary Structure (3°): Once a protein is coiled, the protein will begin to fold onto itself (similar to the way a phone cord tangles around itself); this folding is specific to the protein's function and is called the protein's tertiary structure (3°). Quaternary Structure (4°): Some proteins have an additional layer of structure in which multiple polypeptides, each folded in their own way, come together to form a larger functional unit. This is called the quaternary structure (4°). These large multi-subunit proteins show great complexity due to the unique contributions of each polypeptide. Some examples of proteins with quaternary structure are hemoglobin and antibodies, both of which are made of four separate polypeptides. Anthony Carpi, Ph.D. “Fats and Proteins” Visionlearning Vol. BIO-3 (4), 2003.